Saying goodbye to the people we meet is always hard. We're a long way from home. We're going a long way from wherever we are. And it's pretty certain that for the majority of the people we cross paths with, we won't see them ever again. Saying goodbye to our new friends in Lusaka was especially hard. We'd grown attached to our hosts during our five days there. Though we'd all promised to keep in touch and see each other someday, someday is a very vague, flighty notion. It isn't exactly on our way. Most of Malawi is flanked by a long, eponymous lake. Our plan has always been to reach the shoreline as directly as possible and ride north from there. Sarah, Cassidy, Libby, Brian, and the kids are all headed in the other direction, to the south end of the lake. Getting there would involve a few-hundred-kilometer detour each way. But the great thing about indefinite travel is that detours aren't all too big a deal. Time is inconsequential. The great thing about drawing the flimsiest of routes is that nothing is really too far out of the way. And the great thing about riding bicycles is that when you don't want to ride them somewhere (like, well, a lengthy out-and-back detour), they're pretty easy to haul along on a train, truck, boat, or plane. So here's the plan. We've left Lusaka on the second. We'll leave Lilongwe on the sixteenth. We'll ride to the lake and catch an unreliable ferry to a bay, further south on the lake, whence we'll ride to the beach house. Our Lusaka hosts will leave Lusaka on the nineteenth. Our Lilongwe hosts will leave Lilongwe on the twentieth. And if everything goes according to plan, if everyone gets where they're supposed to go, all of us will arrive at the same lakefront property on the afternoon of the twentieth. That is the plan. The MV Ilala was built in Scotland in 1949. Since 1951 it has been slowly chugging up and down Lake Malawi, delivering cargo and passengers weekly to about a dozen ports on either side of the lake. For most of the past seventy years, it has been famously unreliable. It's unreliable for two reasons. The first is that it's a single ship in a country without many ships, and certainly without many ships built in Scotland in the 1940s. When something breaks, Malawi doesn't have the on-hand expertise to repair it. And so the entire ferry must be put out of service. Lake-contingent transport must wait for the offending component (say, the engine) to be removed and sent to the shipbuilders in Scotland. There, the shipbuilders, who have usually stopped making that particular part perhaps sixty years ago, must study it, look in their archives, maybe cast a new mold, and finally either fix or replace the part. They must send it all the way back down to Malawi, quite a distance from Scotland, generally by boat, where the widget will need to be reinstalled (correctly), confirmed to remedy the issue, and the whole operation put back online. If it's not the right fix, the entire process must start again. This is the cause of the MV Ilala's massive disruptions every few years. More endemic are the week-to-week delays caused by the lake's lack of proper ports. Put simply, there aren't many. At most stops, the ferry just sort of chugs close-ish to shore, idles, and deploys a pair of lifeboats that scurry out the remaining few hundred meters to the sand. Each lifeboat is rated for twenty-two individuals, and each arriving individual must climb up into the boat, heave along their cargo, and take the journey back out to the ferry. 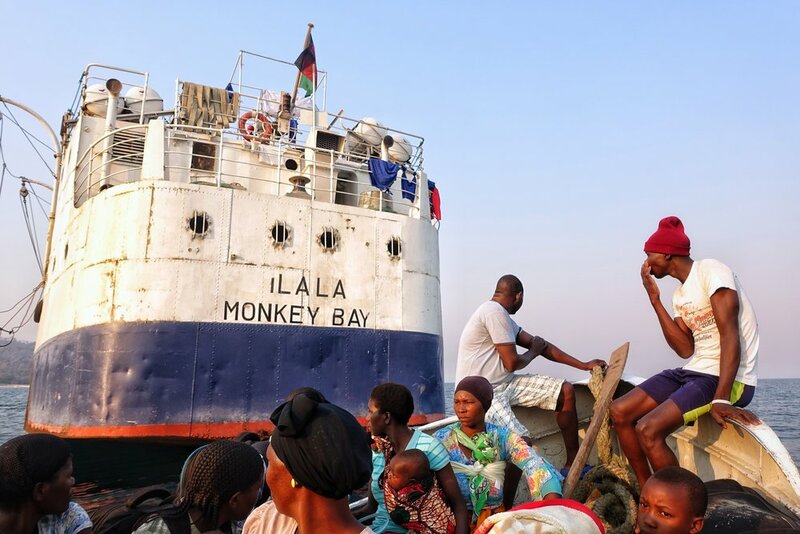 Once at the Ilala, every passenger must climb a ladder to get onboard, and all cargo, be it a kid's backpack or a cattle-sized sack of maize flour, must make it up that ladder too. In some bays (Senga Bay, where we're headed, is one of them), and when water in the lake is particularly low, even the lifeboats can't make it to shore without hitting sandbars. And so the Ilala will get a little close, and the lifeboats will get a little closer, but then the people on the shore will have to wade out, waist- or chest-deep into the water with their belongings held over their heads, to board the dinghys. Now, this all takes time. Folks don't have to buy tickets beforehand for the ferry, and so the captain of the ship has no idea how many people will be awaiting her or him at each stop. Two lifeboats rated to carry twenty-two people means that many trips will need to be made, to and from the Ilala, at most ports. Nor does the ferry and its crew know how much people will be carrying. We hear stories of families moving house from the mainland to an island in the middle of Lake Malawi and bringing all their furniture on the ferry with them. When cumbersome wardrobes and sofas must be loaded onto (and later off) a lifeboat and then a ferry, and maybe even carried waist-deep into the water to start off with, and all of this is to be done without prior planning or notice, it's a wonder the MV Ilala makes it anywhere at all. It takes two days to reach Senga Bay. We are on schedule to meet the Ilala at noon the next day, assuming that the Ilala is on schedule to meet us. Oh, I forgot to mention: the schedule. Further complicating the Ilala's unpredictability is that there isn't really anywhere to get a proper timetable. Ours, pulled offline, appears current to us; but upon arriving in Senga we're told that the ferry is actually scheduled to arrive at 6AM, not noon. It's a good thing we've come early. We're thrilled to learn that Teresie, our Norwegian cycling friend whom we last caught up with in Lusaka, is staying in Senga for the night before striking north tomorrow. She walks down to the beach to meet us at our campsite, and the three of us commiserate over the challenges of eastern Zambia: the hills, the heat, the HOWAREYOU!HOWAREYOU!HOWAREYOU!s. We stay up altogether too late, walk Teresie back to her hosts' in the dark, and get to bed. We set our alarm to be ready for the Ilala bright and early the next morning. It is bright and it is early and it is the next morning. We aren't terribly surprised to find that there is no Ilala awaiting us. No matter. We've packed our things and readied our bikes and grabbed two comfortable beach chairs right along the lake. Whenever the ferry gets here, we'll be prepared for it. The sky turns from a dusky blue to a hazy white. The sun climbs away from the horizon and the sand bakes and the shade that'd been keeping our chairs cool drifts on somewhere else. In other words, time passes. Now and then, we ask an employee at the campground or a local on the beach if they know when the Ilala will show up. The responses are ... varied. "Oh, tomorrow morning. I think tomorrow morning." "Hmm, maybe not until Friday." "The Ilala? It came at four this morning. Didn't you hear the horn?" That fourth response, yes, is a common one. Not just to this question, but to many of the questions we ask many of the people we meet. Here in Malawi, and in Zambia, too. Malawians and Zambians are fantastically friendly people. And yes is a characteristically friendly response (it is, after all, far more positive than no). While most of the locals we meet speak a few words of English, some of our questions can be hard to understand. In these cases, almost all cases, the reply is the same: a big, hearty smile with a confident nod of the head, and a reassuring exclamation. "Yes." Until we figured this out (and even still), this led (and leads) to persistent confusion. If we ask whether an upcoming road will be good, then yes, it will be good. But if we phrase our question differently, if we ask if it will be bad, then yes, it will be very bad. Yes, it will rain today, and yes, there will be sun all day, and yes, the drinks are cold even if they're not, and yes, the Ilala is going to arrive at exactly the time we ask whether it will arrive. It is best not to ask yes-and-no questions: "What time will the ferry come?" Noon comes and goes. One, then two, then three. We begin to wonder whether we should pay for another night of camping. I go to get groceries (tomatoes, onions, bread; the usual) for dinner. I'm walking back when I hear the horn. It echoes through the bay and I turn to see the biggest boat on the water emerge from behind a small island. It's 5PM, and the Ilala has arrived. I rush back to the campground. Lauren has gotten the bikes together and we hastily push them out onto the sand. It's about a kilometer to where the ferry "docks," which is to say the point where one should stand to most directly wade out to the lifeboats that will carry them the rest of the way to the ferry. In between us and that point is a mess of fishing nets and fishing boats and smoking piles of recent catch and men trying to sell us just about everything. A few men offer to carry our bikes and bags out to the lifeboat. It's a lot to haul above our heads on our own, so we agree on two-hundred kwacha each (down from an initial 1,500) for them to carry the bikes while we do our best to keep the bags dry. We catch the second or third round of lifeboats. Us and the bikes are crammed in with about forty-five other passengers (the boat is, indeed, rated for half that) and suitcases and big bundles of textiles. The weight of all this presses us down into a sandbar, and we're temporarily marooned with an impotent engine until a few of the crew jump out to push us free. It's a chaotic, wet, and rather fun boarding, both onto the lifeboat and onto the ferry. We heave our bicycles up the ladder and climb onto the Ilala, ascending a few more sets of stairs to reach the top deck. I always prefer to ride in the common class, as I think any sort of transportation classes, where people with money get to be more comfortable than people without money, are a bit, well, classist. I've met plenty of really wonderful people and made some terrific memories bumping along in the clanging carriages of India's sleeper trains, the bumpy local buses of Nepal, and the most basic transport offerings China and eastern Europe offer. It's a tough but rewarding way to travel. But I have to draw the line at boats. Especially boats with bikes in tow. I don't have the strongest sea legs, and we have this additional cargo to worry about, and the economy section on the Ilala is reportedly awful. Down in the hull, next to the engine exhaust, it's a tangle of limbs and chickens and luggage and fish all vying for space and fresh air. There's intense heat. I feel a little guilty traveling up to the deck, but am relieved to see that it's not too lavish. It's a little bit of space on some old warped boards, likely the same ones the Ilala took on her maiden voyage, with a few cement tables and chairs bolted to the joists. There's a small bar serving soft drinks, and most thankfully, a breeze. It's a bit pricier, but with much more space for us and our bicycles. We set sail. In our wake is a stunning inky sunset over the mountains. Night falls as we head east. Stars emerge. We cross the lake and "dock" at a "port" on the other side. Lauren and I are lying on the planks of the deck trying for sleep. There's commotion as the lifeboats are lowered into the black water and sent out into the black night toward faintly twinkling lights in the distance. The lifeboats have no lights. Later they return, with passengers and cargo, and there's much heaving and grunting over one particular sack that's just so very big. We fall asleep as the lifeboats ferry back and forth to the mainland late into the evening. We turn south. We're headed toward Lake Malawi's southernmost Ilala stop, Monkey Bay. We arrive a bit past midnight and are grateful to find that Monkey Bay is one of the few ports to have a proper walk-off dock. Rather than navigate us and our bikes into and out of a lifeboat again, this time at one in the morning, we can simply carry them down a few flights of stairs and wheel them onto dry land. We're exhausted. My back is causing me a great deal of pain, for which I blame the planks. We don't tend to travel this late at night, so we just ask the security station at the ferry terminal if we can set up our tent next door for the night. They consent. We pitch camp. We're woken before six by the noise and the heat. My eyelids are heavy and my back is still hurting, and we can both use some more rest. We won't meet our friends at the lakehouse until tomorrow, and it's just a thirty-five-kilometer ride from here, so we head about six hundred meters east to a beachside campground and take a rest day. It's actually a pretty miserable rest day. It's hot and humid from early on, we're both feeling consequently lethargic, and there isn't really anywhere to sit to get cool. We have little food and not too many places to get food in this small village, and the monkeys that this whole bay are named for are constantly harassing us for whatever we do have. We sit around, read, and feel thankful when it's over. And then it's Friday. Sarah, Cassidy, and the kids have made it to Lilongwe, and they and Libby and Brian will all be headed several hundred kilometers in our direction this morning. We have just thirty-five kilometers to take care of on our bikes, and the rental house is open for check-in as early as eleven. We aim to beat the heat and get started. Of course, there's not really any beating the heat anymore. We're next to a lake with ample overhead sun, and all day that sun beats down on that lake. At night, that stored heat wafts inland, swampy and oppressive. We're not in the desert anymore, and the day's highs and lows don't have quite the same welcome range. It is simply hot. Anyway, the road is flat. We make it to the house, spacious and seated right on the beach, and check in. We lie underneath a fan until everyone arrives later that afternoon. It's great to see everyone, and there are hugs all around, and we sit outside by the pool and chat while the kids swim. Cassidy hands me a beer and Brian produces a bag of Tostitos shipped from the States. This should be wonderful. But I'm not feeling wonderful. The tortilla chips, which I've regularly dreamed about during our months on the road, seem oddly unappetizing. I finish the one beer and feel a little funny, like maybe I've drank too much. I slide down in my seat and watch the people around me talk to each other, and it feels confusing and tiring, like there's just too much going on. I turn my head and everything takes a moment to refocus. I want to excuse myself but I don't have the energy to make words with my mouth. So I just get up and walk away to our room, hoping no one will notice my rude exit. I lie down in the dark, turn on the air conditioning, and close my eyes. Later, Lauren comes to check on me. I tell her I'm not feeling very well. I think it's just been too much heat, too little sleep, too little water. I just need rest. Cassidy comes in. Cassidy's a doctor, and he asks a few questions to gauge my state. He seems worried. There's a suddenness to the symptoms and rapid worsening of my condition that doesn't sit well with him. Okay, he says. We need to get you tested for malaria.